WASHINGTON, June 9, 2014 — Monitoring a patient’s vital signs and other physiological parameters is a standard part of medical care, but, increasingly, health and fitness-minded individuals are looking for ways to easily keep their own tabs on these measurements. In a pair of papers published in The Optical Society’s (OSA) open-access journal Biomedical Optics Express, groups of researchers from the Netherlands and Israel describe two new wearable devices that use changing patterns of scattered light to monitor biometrics: one tracks glucose concentration and dehydration levels, and the other monitors pulse. 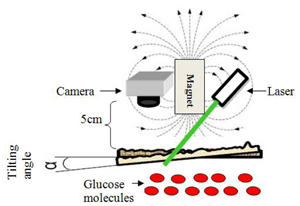 The glucose sensor is the first wearable device that can measure glucose concentration directly but non-invasively, according to the researchers.